The world has gone all digital and now we share our feelings only by texting on social networks and view photos only in virtual albums 😉 and it’s obvious we will be embracing the Goddess Durga this year in new-media and in new avatars too. 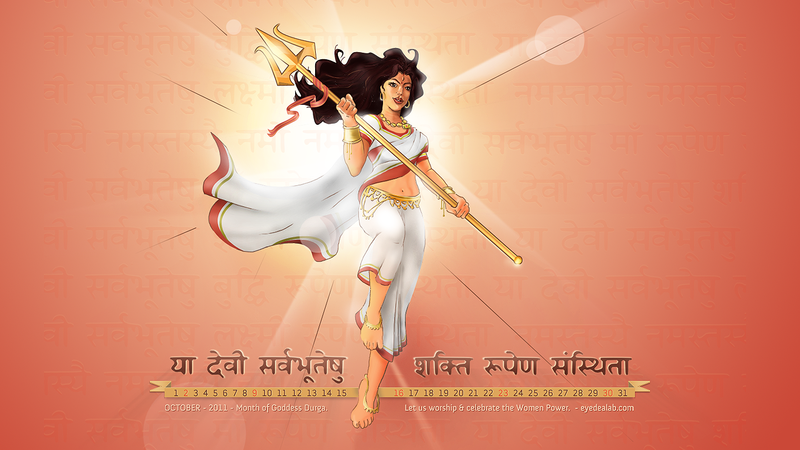 For those of our friends who are not that acquainted with Goddess Durga, she is the icon of energy/force/power of the Hindus. In Bengal Durga-puja is a huge festival. It is a time of homecoming when bengalis return to their roots. It is a time for celebrations when people buy new clothes, clean their home and enjoy the festival with friends and relatives, removing all barriers of class, caste, creed or religion. Since time immemorial Durga has been worshiped as the supreme power, the fearless Shakti and has been mentioned in many scriptures in India. The word “Durga” in Sanskrit means a fort, or a place which is difficult to overrun. Durga, also called Divine Mother, protects mankind from evil and misery by destroying evil forces such as selfishness, jealousy, prejudice, hatred, anger and ego. 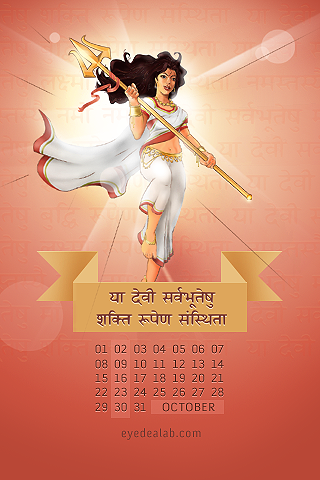 Normally in her images, Goddess Durga is shown in a female form, wearing mostly red clothes. She has eight to ten arms, carrying many objects like conch, lotus and weapons like mace, sword, disc, arrow, and trident in her hands. She uses a lion as vehicle, riding the lion symbolizes her mastery over all these qualities like – power, will and determination. In mythology opposite of Durga stands Asura, the ultimate powerful evil being, the representative of demons and giants and fearless Durga fights the asura to death, thus re-establishing the victory of good over evil. 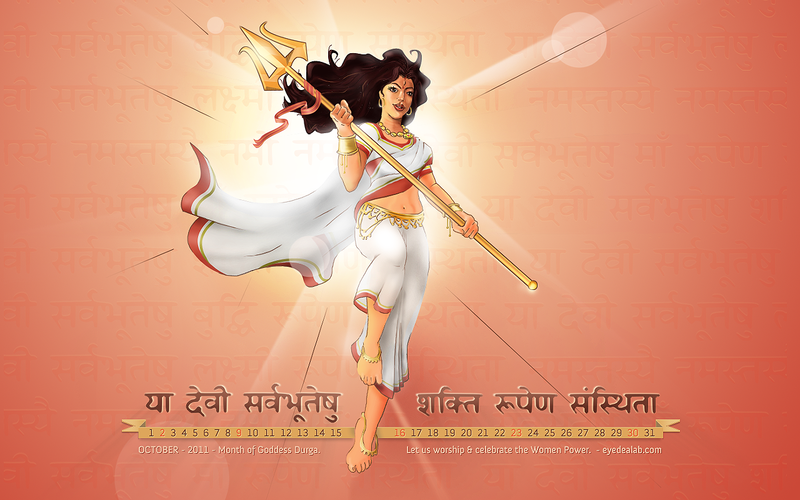 We have dedicated our October 2011 calendar to worship the women power of the world. Since our Durga symbolises any woman here on earth who has the power to create and also protect their own, our Goddess Shakti looks more human carrying only the trident! 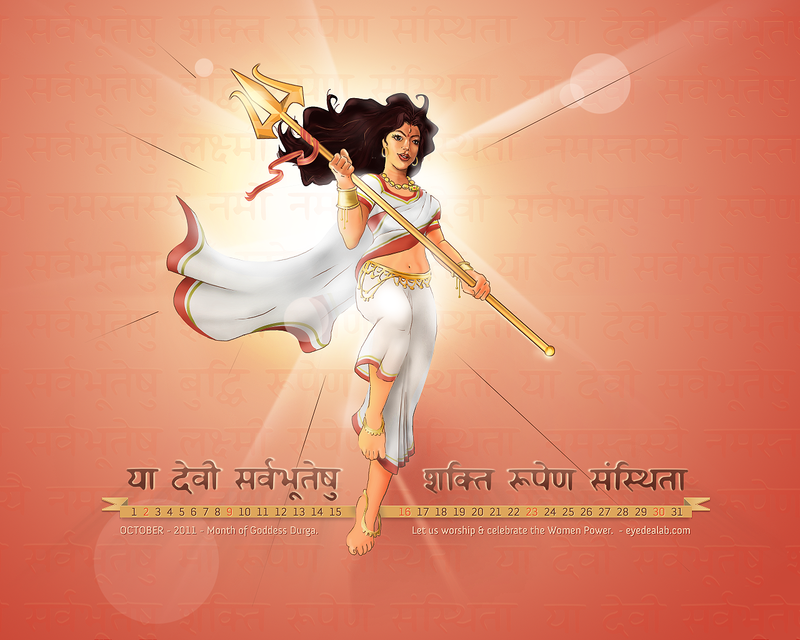 So puritans may not find Devi Durga in her usual attire, along with her lion and multiple arms :). 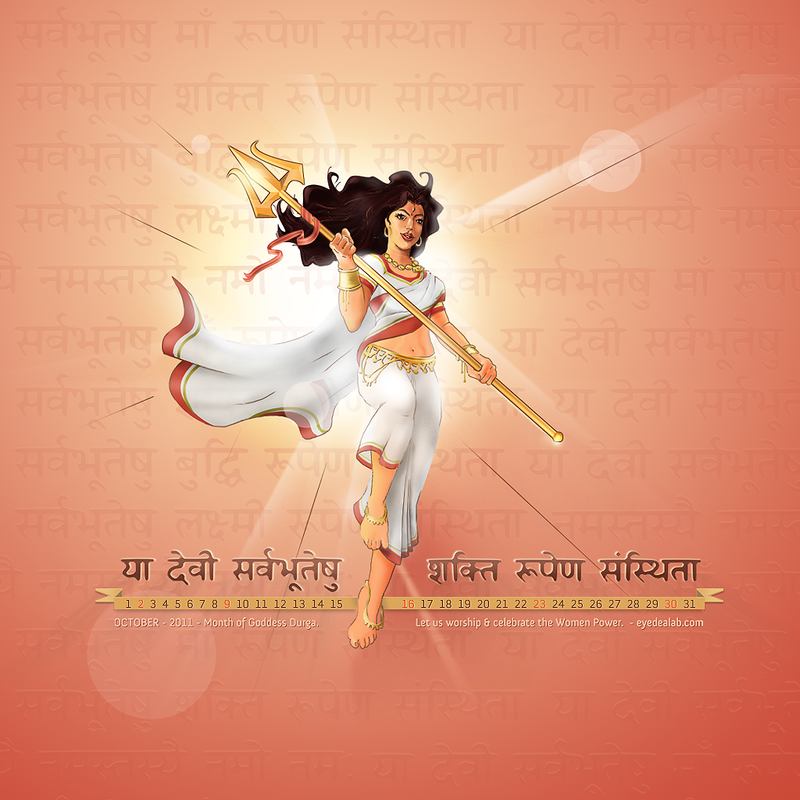 This durga graphics was digitally created with image editing tools. If you liked the desktop wallpaper calendar after downloading, please share with your friends. Last modified on October 2nd, 2012 at 4:56 pm.